Cauliflower is member of the cruciferous vegetable family — which includes cabbages, broccoli, and Brussels sprouts — which is noted for its high nutritional value. The white vegetable, like its green cousins, is packed with nutrients that stave off a host of adverse health conditions. Just like other cruciferous vegetables, cauliflower is widely-known for its anti-cancer properties. The vegetable is found to contain essential antioxidants that stave off cellular mutations that lead to cancer development. One antioxidant in particular, called indole-3-carbinol, is found to reduce the odds of breast and reproductive cancer in both men and women. Cauliflower is also rich in sulfur-containing compounds called sulforaphanes, which are known to inhibit cancer cell progression. Health experts tout that the compound may show potential in combating melanoma, esophageal, prostate and pancreatic cancers. Cauliflower is also known to reduce the risk of lung and bladder cancer. The vegetable is also rich in antioxidants and anti-inflammatory compounds that curb oxidative stress and reduce bad cholesterol levels in the body. The vegetable is also found to promote good cholesterol stimulation and lower blood pressure levels. This makes the cruciferous vegetable essential in preventing cardiovascular diseases. In addition, cauliflower contains high levels of indoles, which are known to have anti-obesity properties. Cauliflower is also notably helpful in preventing various metabolic and inflammation-related diseases. The vegetable is also found to induce fat-burning thermogenesis, which makes it an effective weight loss food. Cauliflower also contains high levels of choline, which is essential in maintaining brain health. The vegetable promotes sleep, muscle movement, and learning and memory. The indoles and sulforaphanes in cauliflower are also found to delay the progression of certain neurodegenerative diseases. The compounds stimulate detoxification enzymes, which in turn addresses neurological injuries associated with Alzheimer’s and Parkinson’s diseases. In addition, cauliflower is an excellent source of vitamin K, which is vital in keeping the bones strong. The vegetable is also packed with vitamin C that boosts collagen production in the body. Collagen protects the bones and joints from inflammatory damage. 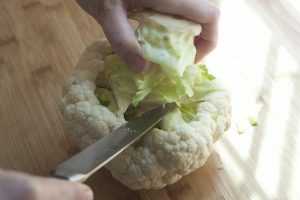 Cauliflower is also known to protect the eyes against the effects of macular degeneration. The vegetable is also essential in electrolyte balance, detoxification and immune system fortification. Cauliflower is beneficial to the heart, the brain, the eyes, and the bones. The vegetable’s rich antioxidant content also offers utmost benefit to the digestive system, the immune system, and the muscular system. Cauliflowers can be used in various recipes including soups, side dishes and salads. Cauliflowers can also be eaten mashed, fried or roasted. Recently, food experts have discovered that cauliflower can serve as a substitute for rice, and can be used as an alternative to flour in certain dishes such as pizzas and pies. Cauliflower protects the body against heart disease, bone injuries, and certain cancers. Cauliflower is also essential in maintaining eye health, electrolyte balance, and detoxification. Cauliflower benefits the heart, the brain, the eyes and the bones, as well as the digestive, immune, and the muscular system. The vegetable, however, can interfere with thyroid function if consumed in excessive amounts or if a person has a pre-existing iodine deficiency. Cauliflower green contains a great amount of calcium. Heavy cooking destroys some of its pharmacological activity. It has average antioxidant and anti-stress qualities.